Destiny 2's maximum Power level will hit 400 this summer, Bungie revealed in a blog post today. The current Power cap of 385 will be surpassed in a couple of different ways. First, 400 weapons will be made available in the Prestige versions of both the Eater of Worlds and Spire of Stars Raid Lair activities. The Prestige modes will release alongside July 17's 1.2.3 update. The Prestige Raid Lairs will also be home to Raid armor ornaments and two Exotic Masterwork Catalysts that will be rare drops and found exclusively in the Lairs. The Prestige versions of the Lairs will carry curated weapon loadouts, so only specific types of guns may be used in each slot, in an effort to create a more challenging experience and shake up the Raid meta. 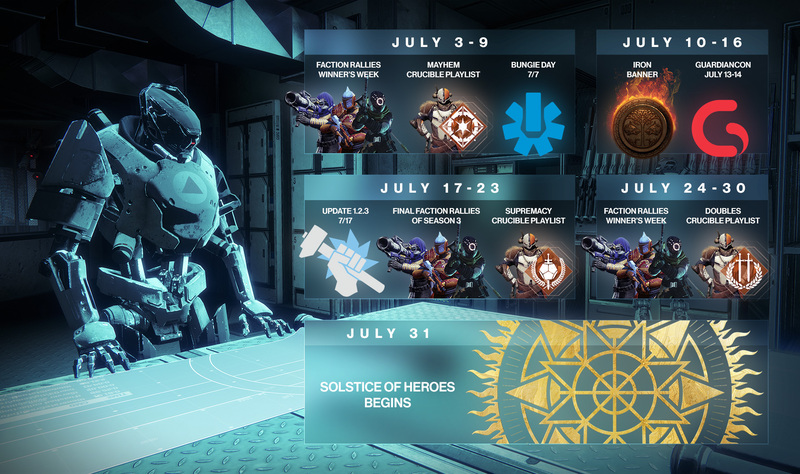 Power level 400 Armor, however, will be attained through the Solstice of Heroes event, which is set to kick off on July 31. Little information about the event is known thus far, but it's the first of its kind in Destiny's history, which is known to have recurring PvE and PvP activities all throughout the calendar year. In the blog, Bungie also revealed an image detailing what to expect over the next month, including details on upcoming recurring events like Iron Banner and Faction Rallies. But the big day is July 17, when a ton of changes will hit alongside the game's last update before the Forsaken DLC releases on Sept. 4. Update 1.2.3 will contain a number of changes to the Crucible, including the inception of full-time six-vs-six Quickplay. Up until now, the game's Quickplay PvP variant has been four-vs-four. Game mode scoring will change as well, along with an update to the Crucible's ranking system. With the big update just a few weeks away, Destiny players still have plenty to look forward to before the paid expansion hits in September.